Prepare yourself for an epic battle! Not on with swords and knights, but a hip-hop battle between some cool cat characters. This online video slot from Booming Games flawlessly combines the two elements in a five reels and three rows game. Explore the 25 paylines from a minimum stake of €0.25 and prepare yourself, for you can go as high as €500. Why is that important? Because the maximum jackpot is 1000x your initial stake and if you do the math, with a stake of €500, that makes a jackpot of €500 000. The Wild is the symbol responsible for this great prize so be on the lookout anytime it lands on the reels. 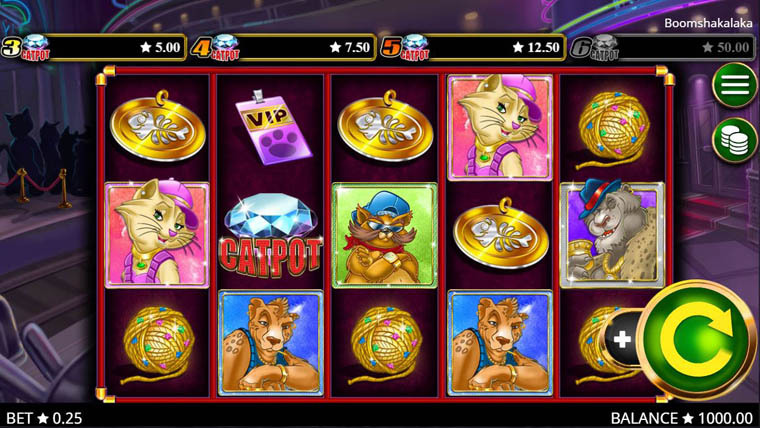 And then there’s the Catpot, a unique type of jackpot specific only to this slot. To trigger it and the 20x to 200x multiplier that it brings, all you need to do is land 3 to 6 Catpot Diamond symbols anywhere on the reels. There are up to 15 Free Spins to be triggered by landing several Scatters anywhere on the reels. Why play it: Boom Shakalaka has an exciting progressive jackpot, the Catpot. This is one of the most exciting features of the game that will make your day, be it that you choose to spin its reels.